Creepy Hollow Woods is a Haunted Attraction located in Jay, FL. CREEPY HOLLOW WOODS is a trail haunt through the woods in Jay, FL. On select nights, they feature a flashlight night, where lights are off and only a flashlight guides guests through the haunt. 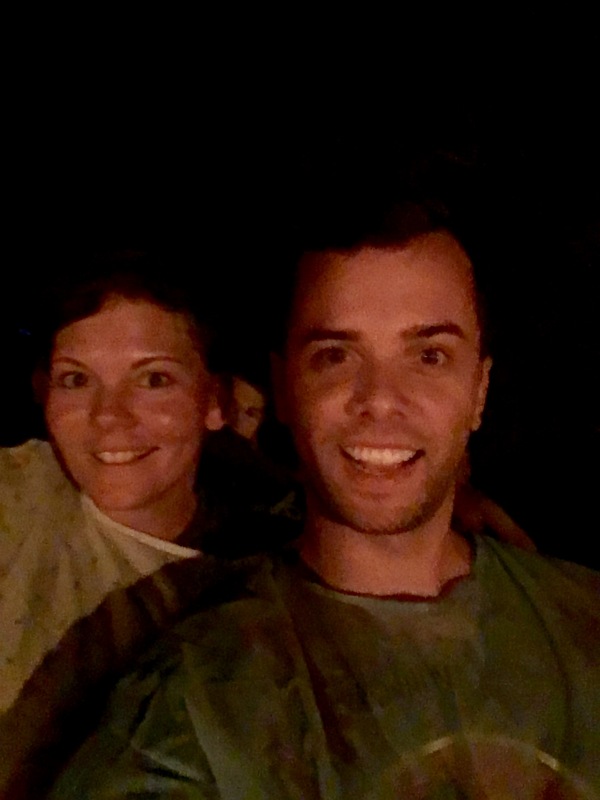 On regular nights, there is an option to have an “insanity” experience, where guests don a hospital gown and opt to be fully interacted with, including physical contact, interaction and moments of being held back within the haunt for extended periods of time. Of course there is also an option to experience the haunt as a standard walkthrough as well. 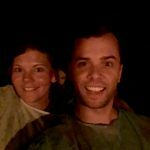 Much of the team’s experience and feedback has already been shared with the folks at CREEPY HOLLOW WOODS, with changes and updates having already been made as well as brainstorming for process improvement, nearly guaranteeing a better experience than our team had for future guests. Preparations have been made for high volumes of “insanity” guests in the future, including more hospital gowns, a separate queue and cast coaching to streamline the experience. For the “insanity” experience, Cast has minimal limits and has nearly free reign to touch, including but not limited to grabbing, pulling, shoving and pushing through the haunt. While sometimes effective, the mostly young cast suffers from lack of spatial awareness and controlled force upon the Guests. The team nearly came in contact with props as the Cast lacked the spatial awareness to safely use these in close proximity to Guests’ faces. Similarly, hats and masks frequently came in contact with faces, ruining the illusion of character. Proper training should be required for any interactive weapon stunts, especially for young Cast members. Due to the high number of “insanity” victims, the rooms often got backed up as the Cast waited for the next rooms to clear and became frustrated that they had to hold these Guests for longer than normal. The team frequently encountered actors saying things such as “I don’t know why they sent you already, I’m not ready for you” or “Come back here, the next room isn’t ready for you yet,” destroying any illusion of character. The Cast had no ability to stall with themed dialogue or interaction and fumbled trying to manage the operation of the haunt’s Guest flow along with the performance they were supposed to deliver. The story ended up being pushed aside in order to get Guests from point A to B. At another point, a team member, while laying in a casket for an extended amount of time, heard another Cast member enter the scene and say “We’re having audio issues.” Fortunately, the actor in that scene suggested they leave the scene to discuss it. For an interactive haunt, the Cast seemed to lack the skill to provide quality interactions and the improvisational acting necessary to deliver the story and effectively carry on dialogue with Guests. Frequently, when our team would respond back in dialogue with the Cast, it would cause actors to break character and not know how to respond. In the asylum room, a conglomeration of teenage girls seemed to be seeing what they could get away with, so when a member of the team followed their direction and bit a (dirty and gross) prop, the girls ran off and giggled discussing “I can’t believe he actually bit it,” again tarnishing the experience and believability of the characters as a whole. There were a few effective performances that are worthy of a mention. The first character you meet in the trail to the ticket booth does a good job of welcoming Guests and providing warning of what lies ahead. The Mohawk clown that welcomes Guests into the first room of the haunt effectively starts off the experience with a good performance. The ladies in the snake room interact well with Guests, whether or not their slithery danger noodles affect them, adjusting the intensity level accordingly. Costuming is rather complete creating unified looks for the characters. Makeup is simple yet effective. Masks are occasionally well done yet somewhat clumsy at times, making interaction nearly impossible through a muffled mask. Characters used their masks to press against Guest faces ruining the appearance of a character face. Similarly, some mask edges were very visible also shattering the illusion of character faces. Movie villain characters were frequently used, where as the original characters were more effective overall. Costuming as a whole was well done and thorough without detracting from the experience. While the staff at CREEPY HOLLOW WOODS was overall delightful, helpful and available as needed, the layout of the entrance queue, ticket booths and full queue unfortunately suffered, providing a lackluster experience. The haunt had a delayed opening and, while understandable, it caused guests to stand in a tight queue before being able to purchase tickets at the booths, thus standing in a narrow path staring directly into a poorly placed strobe light for an extended period of time. Once the ticket line started moving (slowly, due to a clumsy waiver and hospital gown distribution process), Guests filtered into the main queue. Due to the large amount of “insanity” customers, the lady at the front of the queue had a challenging time grouping standard Guests with an appropriate amount of “insanity” Guests. After our team suggested that a separate queue would greatly boost this efficiency, they built and implemented one to try to alleviate this frustration for future weeks. 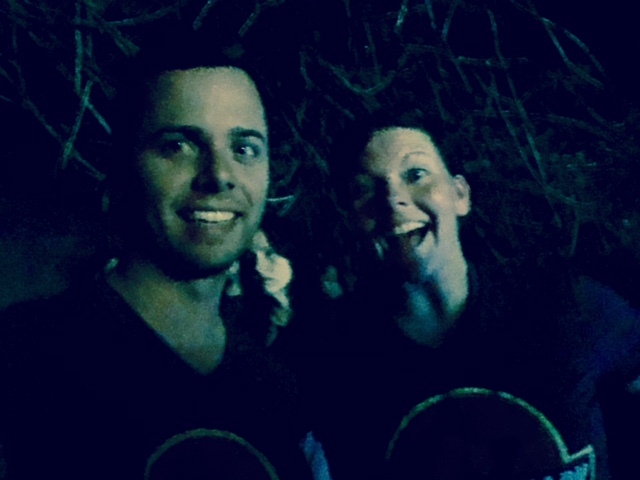 Upon entering the haunt, besides aggressive safety challenges from the Cast, there were several other safety concerns throughout the attraction. A team member was forced to sit on a freestanding toilet, which was sinking into a hole in the ground, thus not providing a stable seating place for a Guest. The uneven ground effect in the first blackout room provided a couple trip hazards for other Guests due to some edges of the effect being insufficiently buried. While there are allegedly Cast stationed throughout the blackout maze, a lot of Guests were panicking, freaking out and not enjoying their trip through the maze. At the end of a frustrating experience, it makes for a less than optimal ending to the haunt, traversing pitch-black hallways with screaming children and teenagers. Blood frequently comes in contact with “insanity” guests, including bloody hand holding and a syringe squirt of blood, often carelessly splashing onto faces as well. Though not without challenges, the hospitality of our host, Alex, as well as the rest of the Staff was positive, friendly, helpful, and enjoyable. Not by design, but the location of this haunt is perfect, driving on several pitch-black roads to get to the CREEPY HOLLOW WOODS. Entering through an unmarked parting in the woods, with a dark path through the woods to the ticket booth, this portion of the attraction perfectly sets the mood for a haunt deep in the woods. The general queue area had moderate atmosphere enhancements including torches, lighting and some sound effects, but mostly heard was the sound effects, screams, and special effects from the haunt. The tiki torches, though low and a bit close to Guests, set the mood with some nice natural fire light. CREEPY HOLLOW WOODS has some nice special effects from large scale puppets to smaller effects, including some which triggered effective startle scares. Effects are well used to create some variety and surprises within a trail haunt. The haunt is well lit, especially helpful to an interactive haunt where vision is vital for the interactions. However, some areas can be clumsy including Leatherface’s fumbling with his remote control lighting and the too-long, too-dark finale to the attraction. Layout is effective and uses the space well, however it is mostly built from garage doors, without much focus to camouflage them through paint, distressing, or coverings. The most effective scenery is at the beginning of the attraction through the brightly colored clown section. Special effect animatronics were nicely placed throughout the haunt, though sometimes not lit well enough to be able to see them in action. Generally void of an overarching theme, the CREEPY HOLLOW WOODS are a place where anything can happen and no apparent theme is followed. Unfortunately, CREEPY HOLLOW WOODS’ “insanity” experience lost a majority of its scare factor to the clumsy interactions and Guest flow issues. The best scares were driven by the special effects that did not rely on Cast to trigger them. The Cast was so completely overwhelmed with trying to keep Guests efficiently moving through the haunt that a good amount of them gave up on their scaring to work on getting Guests through, or were focusing so heavily on the “insanity” Guests through intense interaction as opposed to scary elements. Some effects, however, weren’t triggered properly due to timing through the haunt and, when effects didn’t work, the Cast had no contingency plan for interaction or backup dialogue in place for delays. Though a decent walk through time, there was a plethora of dead space and stalling, including over 10 minutes laid in a coffin while nothing happened around or in the room. Being pulled backwards through several rooms also ended up elongating the experience, making it longer than anticipated. While a reasonable charge for the standard experience, “insanity” is only 5 dollars more, a minimal upcharge, causing a great amount of people to choose it. If it were a larger fee, it may deter a portion of people from upgrading to “insanity,” and increasing the experience for those who do choose that option. 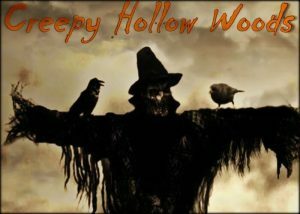 CREEPY HOLLOW WOODS does run a food drive during the season, offering a $5 discount on tickets with a canned good donation (one per person), benefitting local food banks. The ticket booth is quickly filling with canned goods, a great thing to see, especially after recent hurricane impacts to the areas. If you happen to be close by or within a short drive, head on down to CREEPY HOLLOW WOODS in Jay, FL. If lines are long and everyone in sight is wearing a hospital gown (indicating insanity experience), opt for the standard experience as wait times will be long and, until they figure out how to increase capacity for “insanity” guests, the experience is likely to be much like rush hour traffic. 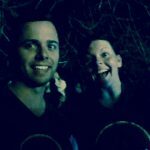 We are locals and have visited these kinds of attractions over the past 25 years and Creepy Hollow …show more Woods was hands down the BEST we have EVER been to!! I went with my Best Friend and Husband and we had a blast !! Right from the start we were wondering what we had gotten into . I go to Universal Halloween Horror Nights every year and this haunt was right up there with them. Honestly I screamed more here. I highly reccomend this to anyone looking to have fun with your friends or family. We may do the “insanity” next year if we aren’t to chicken but this year we got every pennys worth !!! We be back next year for sure!! !